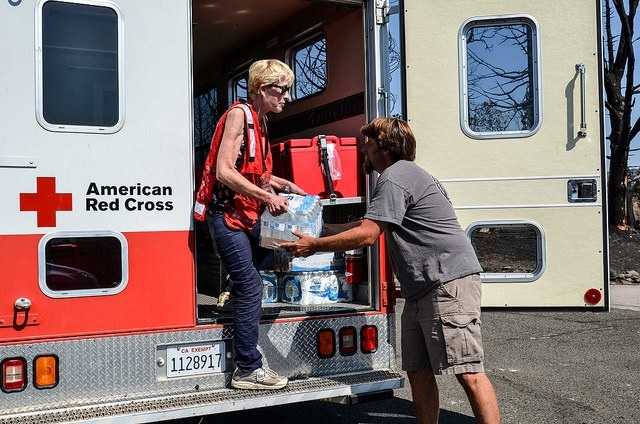 Volunteer Carrie Reilly delivers water and supplies to residents impacted by 2014’s Boles Fire in Weed, CA. I was sent someplace – can’t recall where – but a big fire had swept through a small city leaving it a lunar landscape. I was with the ERV [Emergency Response Vehicle] doing mobile feeding and it was just as the first light of day on a cold overcast morning that my partner and I suddenly noticed the people combing their property for anything of value suddenly stop and stand up. Utter silence engulfed us. Then, the most beautiful sound reached our ears. It was the sound of a single trumpet playing taps and someone slowly raised an American flag. When the final notes ended, the sun suddenly burst through the clouds. The chill of the day appeared to dissipate and warmth touched every heart and face. Freddie Az was my partner and we didn’t speak or move for minutes. I can’t explain it but it was as if every dead tree had absorbed the sound of taps and was echoing it back to everyone. Carrie and volunteer Freddie Az, prep an ERV to head out and deliver food, water, and supplies to disaster victims. Taps was played in honor of the fallen town, but in my heart I’ve always believed it was those notes that began the rebirth of that blackened landscape and the people who had lived in those homes. The tribute of taps being played, along with the raising of the American flag, certainly was far more than any thank you I have ever received. 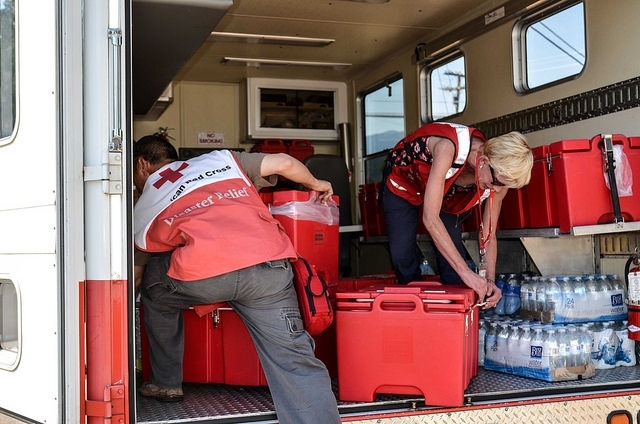 I have never worked any disaster – close by or far away – where the majority of people didn’t thank me as a Red Cross volunteer. I have met upset people, angry people, dazed people – but if I had to put it into words I’d say the reason for being a Red Cross volunteer is because it is in times of disaster that the best of mankind asserts itself. 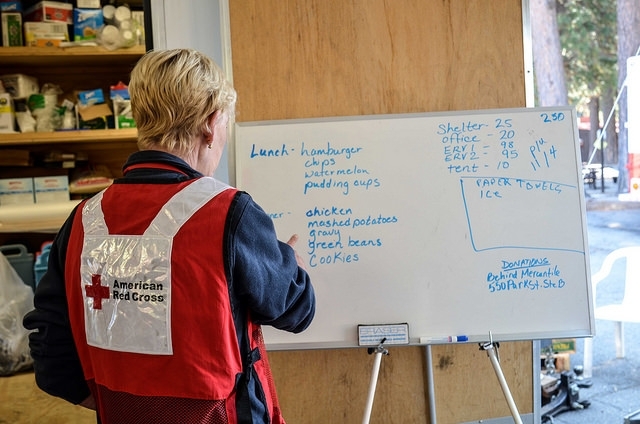 Carrie Reilly joined the Red Cross the day after Hurricane Katrina hit – 10 years ago this August – and spent two weeks helping the disaster relief efforts in Louisiana. Upon her return home she took the first Emergency Response Vehicle (ERV) class available and has taken numerous training classes since. She has deployed to many disasters, locally and nationally, providing shelter support, bulk distribution, mobile feeding, disaster assessment and much more. Carrie checks the latest info before heading out on the next ERV delivery run.